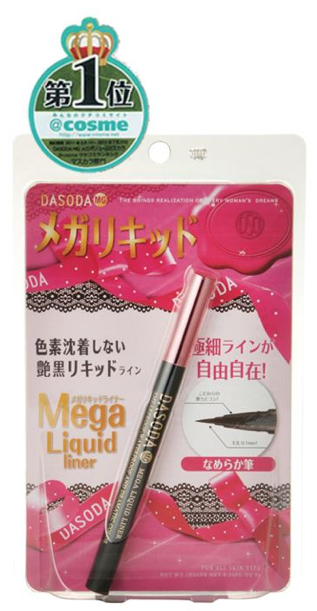 Dasoda MG Mega Liquid Liner - Makeup that repairs and moisturizes to nourish the roots of the lashes! This eyeliner combined moisturizing essence such as "Hyaluronic Acid, Collagen, Keratin & Panthenol" cares for the eye area. Contains the blackest possible carbon black ink which can produce a lustrous dark black, clearly different from a thin black dyed ink. Since the carbon black ink doesn't penetrate the skin but adheres to the surface, no pigmentation occurs. It quickly blends into a facial cleanser and easily washes off. Once dried, the water-resistant polymer coats the eye line surface and prevents it from smudging for hours! Easily washes off with warm water and facial cleanser. Retail at S$19.90 at Sasa stores.